Hello and welcome to this week's #ECGclass! This week it's @J_vanOppen here and we'll be talking about hypertrophy. To join in, ask questions or add comments, please use the hashtag #ECGclass so everyone can follow. First of all, let's do some revision of last time's material. @hcwetherell talked about a methodical approach to ECG interpretation of Rhythm - Rate - Intervals (looking at each lead in turn) - Axis. What do you reckon to this ECG? Rhythm: sinus (P waves before every QRS complex). Rate: 70ish (300 divided by number of big squares between R peaks). Intervals: PR 4 small squares, QRS 2 and QT 9 (normal). Axis: Normal (Lead I and aVF both predominantly positive). This is a normal ECG. Right, revision over! Let's move on with tonight's class. Q1: Have a go describing this ECG in terms of Rhythm - Rate - Intervals - Axis. Q2: Compare this to the normal ECG we saw during revision - what looks different? Look at the precordial leads (V1-V6) in particular. Let's recall some anatomy here. The back of the heart (predominantly left ventricle) is twisted forwards around the mediastinum. This is because the muscle hypertrophies to overcome obstruction in the system (remember Starling's Law?). The left ventricle is straining, hence the ST depression in the lateral chest leads. >> This is left ventricular hypertrophy (LVH) with strain pattern due to aortic stenosis. Your next patient is a young woman with recurrent syncope and chest pain, but the ECG picture is just as applicable to your older patients with chronic lung disease. Q3: Let's apply the Rhythm - Rate - Intervals - Axis method to this ECG. Q4: What's abnormal on this trace? 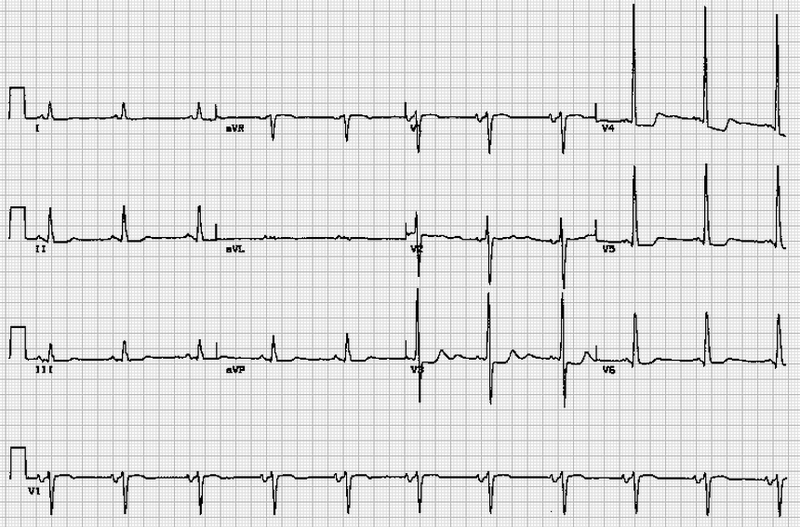 ST depression and T wave inversion in inferior and chest leads. Dominant R wave in V1 and S wave in V6 suggests right ventricular hypertrophy. The tall p wave ('p pulmonale' - look at Lead II) shows right atrial hypertrophy. This is a patient with pulmonary hypertension whose right heart chambers are working hard to overcome the increased pressure. Thank you for joining in with this evening's #ECGclass! Hope you enjoyed it and found it useful.